Saudi Arabia, Egypt, the United Arab Emirates and Bahrain severed their ties with Qatar on Monday, accusing it of supporting terrorism, opening up the worst rift in years among some of the most powerful states in the Arab world. The coordinated move dramatically escalates a dispute over Qatar’s support of the Muslim Brotherhood, the world’s oldest Islamist movement, and adds accusations that Doha even backs the agenda of regional arch-rival Iran. Announcing the closure of transport ties with Qatar, the three Gulf states gave Qatari visitors and residents two weeks to leave their countries. Qatar was also expelled from a Saudi-led coalition fighting in Yemen. Oil giant Saudi Arabia accused Qatar of backing militant groups and broadcasting their ideology, in an apparent reference to Qatar’s influential state-owned satellite channel al Jazeera. Saudi Arabia, Egypt, the United Arab Emirates and Bahrain accused Qatar of supporting what it described as Iranian-backed militants in its restive and largely Shi’ite Muslim-populated Eastern region of Qatif and in Bahrain. The measures are more severe than during a previous eight-month rift in 2014, when Saudi Arabia, Bahrain and the UAE withdrew their ambassadors from Doha, again alleging Qatari support for militant groups. At that time, travel links were maintained and Qataris were not expelled. The diplomatic broadside threatens the international prestige of Qatar, which hosts a large U.S. military base and is set to host the 2022 World Cup. It has for years presented itself as a mediator and power broker for the region’s many disputes. The announcements come 10 days after President Donald Trump visited Riyadh to call on Muslim countries to stand united against Islamists extremists, and singling out Iran as a key source of funding and support for militant groups. “It seems that the Saudis and Emiratis feel emboldened by the alignment of their regional interests, toward Iran and Islamism, with the Trump administration,” said Kristian Ulrichsen, a Gulf expert at the U.S-based Baker Institute. 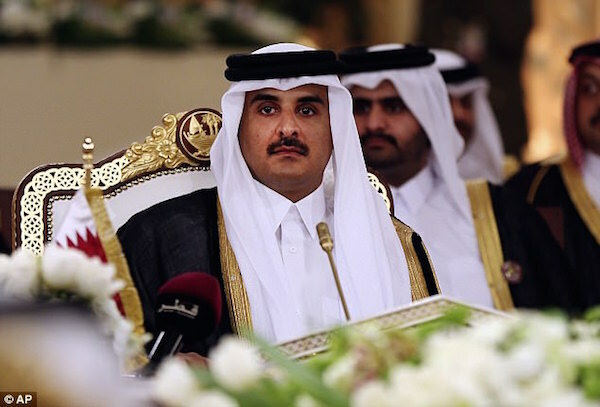 Qatar has used its media and political clout to support long-repressed Islamists during the 2011 pro-democracy “Arab Spring” uprisings in several Arab countries. Muslim Brotherhood parties allied to Doha are now mostly on the backfoot in the region, especially after a 2013 military takeover in Egypt ousted the elected Islamist president. Oil prices rose after the moves against Qatar, which is the biggest supplier of liquefied natural gas and a major seller of condensate, a low-density liquid fuel and refining product derived from natural gas. Yes they are all responsible! They should beat each other to death and do the world a favor.